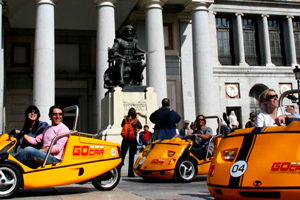 For those who love their independence, we would like to suggest this wonderful tour of the city on board a Go-Kart with an invaluable commentary from the audio-guide. Thanks to the excellent integrated GPS system, you will be free to drive your private Go-Car around Madrid, enjoying the city's spectacular attractions whilst listening to the audio commentary at the same time. You will be at liberty to stop whenever you like for a coffee or a hot chocolate with churros....and maybe a photo stop! You can choose from 4 different tours that have been created to get the best out of the city. Historic Madrid: with this itinerary which lasts about two hours, you will have the opportunity to fully appreciate the oldest part of the city. The most important places on the list include: Plaza España, the Royal Palace, the Almudena Cathedral, la Latina Quarter, the San Miguel Market, Plaza Mayor, Puerta del Sol, Gran Vía and much more. A Special Tour of Madrid's Athletics Stadium: with this itinerary which lasts about three hours you will be able to visit historic areas of Madrid and the Stadium as well. The route covers visits to: the famous Plaza España, The Royal Palace, the Almudena Cathedral, Puerta de Toledo, the Vicente Calderón Stadium, the Cebada Market, the San Miguel Market, Plaza Mayor, Puerta del Sol and plenty more. A Special Tour of the Bernabéu Stadium: with this itinerary which lasts approximately three hours, you will have the opportunity to discover some of Madrid's historic areas and this famous stadium as well.. The route covers visits to the Gran Vía, Plaza Cibeles, Puerta de Alcalá, the marvellous Retiro Park, the Chueca neighbourhood, the Paseo Recoletos and much more besides. Cosmopolitan Madrid: with this itinerary which lasts around two hours, you will be able to explore the wonderful cosmopolitan districts of Madrid. This includes a visit to the Prado Museum, Plaza Cibeles, the city centre, Puerta de Alcalá, the Retiro Park, the Reina Sofía Museum, the Plaza de Las Ventas bull-ring, the Salamanca district, the Chueca neighbourhood, the Paseo Recoletos, the Gran Vía and plenty more. On the day of your visit, just show the tickets on your smartphone at the entrance of the GoCar office. Available from April through to October from 09:00 to 21:00 and from October to March until 19:00 hours.